Heart of Oregon Corps has operated in Prineville for about four years, but during that time, they haven't had a permanent base of operation. "Our crew is kind of scattered," said Colin Price, who oversees the nonprofit's AmeriCorps program. "We had some room for a small office in a building with some other county facilities and nonprofit groups, and we had a shed that was tucked behind COIC. We have been kind of using space wherever we can get it." That will soon change. Heart of Oregon is about to move into a new facility next week. Located on a piece of property that was once part of the Ochoco Elementary School and is now part of the Ochoco School Crossing affordable housing campus, the building is awaiting final inspections and approval of an occupancy permit. "It's nice to have a central home and a location to really begin developing our presence a little further in Prineville," Price remarked. Heart of Oregon Corp has been operating in Central Oregon since 2000 and features several different youth-based programs. Two of them, the Central Oregon Youth Conservation Corps and the Camp Lead program, are based in the summertime. "We operate a YouthBuild program, a national model funded through the Department of Labor," Price added. "We operate a thrift store in Madras and a work crew that services Deschutes County Transfer Station, called our stewardship crew. Then we have my program, the one that is going to be running out of Prineville. It focuses on natural resource conservation work." Price praised the process in which Heart of Oregon managed to secure its new location, calling it "a great example of community partnerships coming together." "Our YouthBuild program works a lot with Housing Works, and Housing Works was the developer on the Ochoco Crossing affordable housing (project)," he noted. "R&H Construction was using this modular that at one point had been an elementary music classroom. It was going to cost a lot of money to get rid of it or tear it down, so Housing Works approached us and said if we gave you some land on the property, would you be interested in taking over this facility." Eager to pounce on the opportunity, Heart of Oregon moved the modular to the northeast corner of the property, tore down their shed behind COIC and moved it to the location and started storing tools and working on equipment setup. 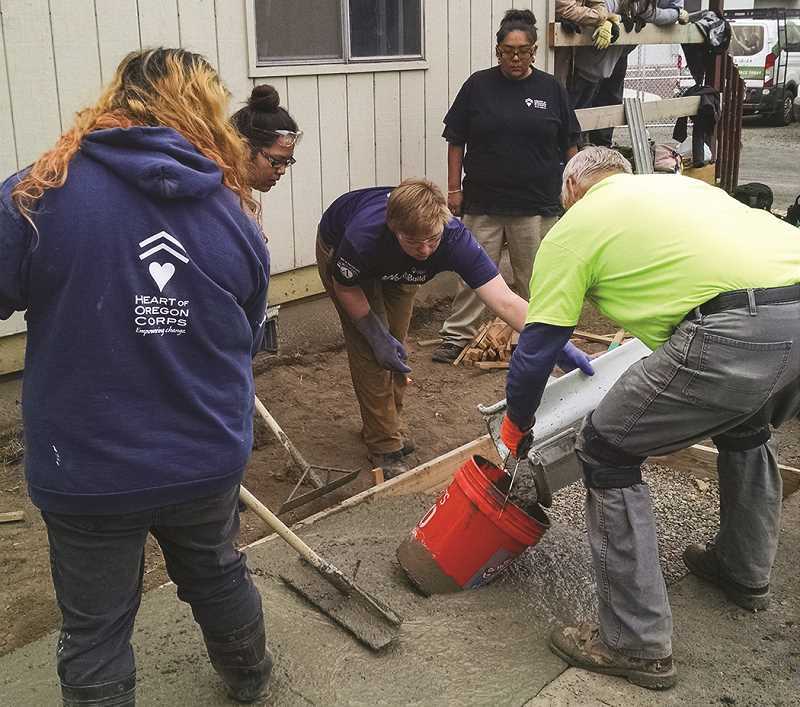 "Some of my Prineville AmeriCorps team did the painting on the inside and outside," Price said, adding that the YouthBuild program helped pour concrete for the modular site and build an accessibility ramp. "We helped with the landscaping, spreading the gravel, things like that." Once the building is approved for occupants, it will provide office space for Price and three other staff members for summer-based program. In addition, they will store equipment for the AmeriCorps crews. "Most of the projects we work on are things like fencing projects for habitat protection and fire fuel reduction," he said. Price said the new facility helps cement Heart of Oregon's presence in the Crook County community, adding to the vans bearing the nonprofit's logo that travel out to local projects. "We are excited to continue putting down some roots in Crook County and helping partner with folks who are already doing good work out there to make sure that the youth in our community are getting access to what they need," Price concluded.